This post is intended for viewing only by those of legal alcohol purchasing age. Please always remember to drink (or eat in this case) responsibly! 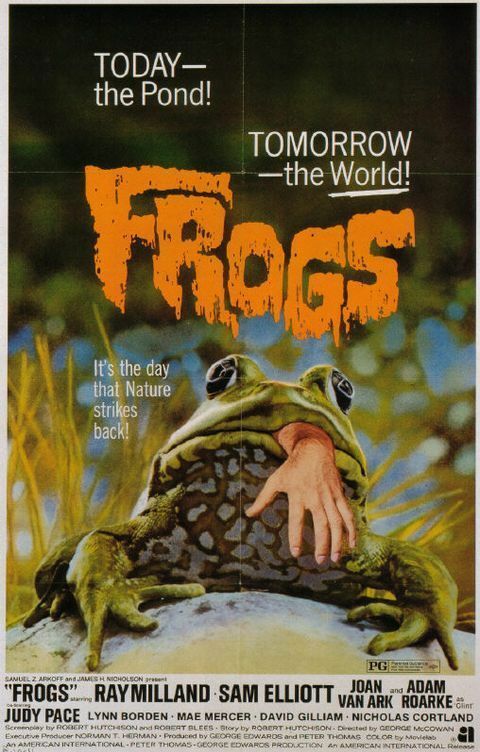 The first horror movie I ever remember seeing was about frogs. In fact the name of the movie was Frogs. It was an old school movie made in the 1970’s and though by comparison to the current day slasher films and heart-attack psycho thrillers it was unquestionably tame, to an unsuspecting youngster it tugged at the communal fear of things that go bump in the night. What I’d always believed were sedate almost cartoon-like creatures, evolved at the hands of this film to leave me thinking these amphibians were carnivorous beasts devouring humans willy nilly. It was horrific to my naïve sensibilities. I’ve never made jello shots. Truth be told I’ve never actually had a jello shot but do subscribe to the ‘no time like the present’ philosophical bent. I’m not a jello eater but I do like the texture of jello. It’s playful and whimsical and I can see how someone adopted the jiggly goo into an edible cocktail of sorts. When thinking up fun additions to the Halloween festivities for adults it seemed a good time to make my first jello shots with booze. 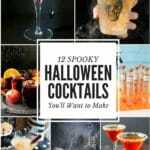 What better spirit to make it with than Candy Corn Vodka? I made Candy Corn vodka last year on a whim, frankly expected to be totally grossed out by the end result. However much to my surprise, during the infusion process the heavy dose of sugar disappeared leaving only the buttery flavor of the candy infused into the vodka. It was a fantastic outcome and one bearing reuse past the Martini with Pop Rocks rim I used it for Halloween last year. I was really looking to make something with some sass. I did not want to use traditional jello mix, desiring more basic ingredients. After watching videos on You Tube I adapted a recipe I found for Gin and Tonic jello shots. 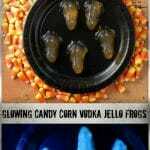 Not only would they prove to dazzle in Halloween orange using Candy Corn Vodka, but they also would glow under black lights. The secret to the otherworldly glow is the quinine in tonic water. When under a black light it bears an alien feel, in this case, evoking the sheer terror I felt when watching the Frog movie. 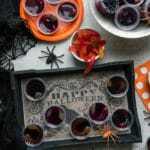 Of course any shape of your nightmares can be used for these jello shots. I used a hard candy mold which allowed the frogs to pop easily out with come coaxing around the edges first. I tried a batch using a silicon ice tray of skulls and crossbones and found the small details did not allow the jello to release easily intact. Larger silicon Halloween shapes for ghosts of other less detailed figures would be perfect as well as releasing the jelled shapes easily. 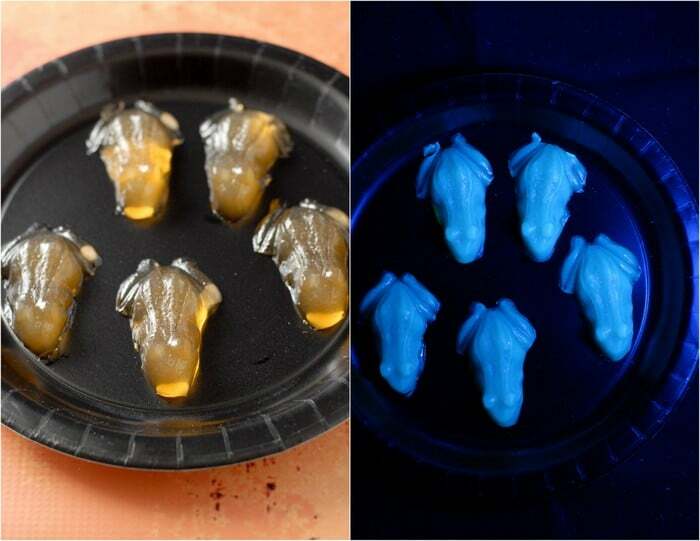 These unsuspecting frog jello shots come to ghostly life under a black light! The quinine in the tonic water causes them to glow with a perfect Halloween eeriness. 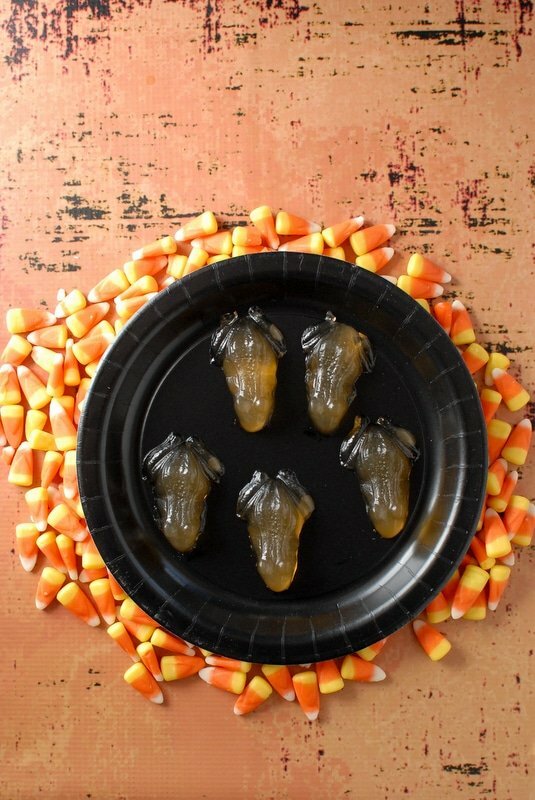 Any molded shape can be used for these Candy Corn Vodka Tonic shots. Pick your pleasure! Prepare clean, dry mold for jello shots by lightly spraying with cooking spray or wiping with a paper towel moistened with vegetable oil . Set aside. Pour the Candy Corn Vodka into a small heatproof mixing bowl or 2 cup (or larger) Pyrex liquid measuring cup. Sprinkle the unflavored gelatin on top of the vodka. In a small saucepan, bring the tonic water to a just to a boil. Pour sugar into the heated tonic water and stir to dissolve the sugar. Pour the tonic-sugar mixture into the vodka-gelatin; stir to combine and ensure gelatin is dissolved. Pour into prepared molds. If making smaller sized jello shots, a funnel may be used to better control the gelled mixture into the molds. Place in the refrigerator until firm. To make the shots glow, display under black lights! I was wondering what made these drinks and jello shots glow. Fascinating! I’m relieved people aren’t using weird toxic chemical for these glow in the dark drinks. What a great idea for halloween! It’s such a simple surprise isn’t it Laura? I even used organic Tonic Water. I love the whimsy of Halloween and the effects in food but like you can’t get past the chemical options for some of them (though certainly my recent Pinata Cake was full of traditional non-organic candy!). I recently made a layered drink loving the chemistry involved with the sugar weight of the drinks causing the layers to be suspended. But also not wanting to use soda or other heavy corn syrup, articially flavored drinks. Was delighted to make it work with two organic juices and Vitamin Water. the non-glowing frogs appear to be two-toned? what is the yellow layer closest to the plate (the belly-side of the frogs)? am i crazy? You are not crazy Carla! The frogs are not two tone but I looked back at the photos and think I see what you are seeing in the large collage at the end of the post. The frogs are a light, translucent orange but what they are sitting on affects the color. The two tone affect is from the light source in the photo shining through them. This is beyond clever!!! I love that the jello shots glow in the dark! My childhood horror was Ssssss!… (another schlocky reptilian creature feature) I’ve always considered jello shots “cocktails for people that don’t like to drink” and have fallen victim to monstrous hangovers more times than I care to remember from them. … and suffer for it later. These frogs are not crazy-boozy fortunately. I do see how it would be very easy to eat several before one realized how much they were ‘drinking’ (in general, not with these). 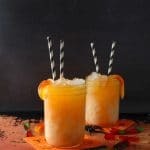 I loved the way they turned out and using more Candy Corn Vodka! So. Cool. A local apple farm recently expanded and built a distillery. Can’t wait to try these with some of their vodka! Great idea! This experiment flung open the doors of imagination for future options Nancy, and I see it did for you too! 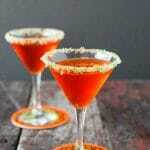 I actually infuse my own Apple Vodka and when I was going to make these that thought crossed my mind too. I’m sure yours will be delicious! These are so cool! I remember the movie Frogs, as well. It was scary & hilarious. Saw it with friends for someone’s birthday. I even wrote about it last year on my blog. See post from 3/2012 at http://www.wildtrumpetvine.com. 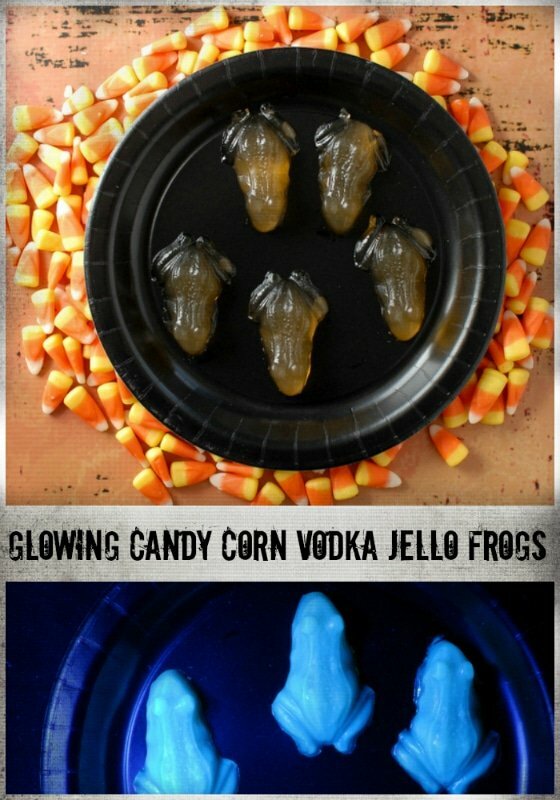 Gonna have to try these frogs! Thanks! Oh my – an alien feel alright! Glowing amphibians, coupled with images of Ray Milland (he of The Lost Weekend) Sam Elliott, and Joan Van Ark with monster frogs fighting back is almost too much to bear! A person could croak… this post is a dazzler, shall I say, from start to finish. Brava! When I located the movie poster to include in the post Adri I was surprised at the cast! Actors who I associate with certain work but as a child had no idea who they were and of course was only impacted by the violent frogs at the time. So glad you liked my little project!